A neighbour has spoken about the ‘terrible and shocking’ Melton house fire which claimed the life of her 72-year-old friend last night (Sunday). Susan Norwood was alarmed to see fire coming from the property next-door in Lambert Close shortly after 8pm. A 72-year-old woman died in the blaze and two men, aged 70 and 32, were taken to Queen’s Medical Centre in Nottingham suffering from smoke inhalation. Mrs Norwood told the Melton Times: “It was a shocking incident. It was terrible how quickly the fire took hold. “Quite a few neighbours were outside their homes and I know several of them had called the emergency services. “The men had come out of the house with blackened faces. “There were a lot of fire crews here and they seemed to get it under control fairly quickly. A spokesperson for East Midlands Ambulance Service (EMAS) said: “We received a call at 8.05pm to Lambert Close. “The caller reported a house fire with three people trapped. “Due to the large scale incident we sent two advanced Community First Responders, a Paramedic on a Fast Response Vehicle (FRV), a paramedic manager on a FRV and two double crewed ambulances. “We transported two patients to Queen’s Medical Centre with smoke inhalation. “One patient was pronounced dead on scene. Leicestershire Fire and Rescue Service was today investigating the cause of the blaze. The woman who died has not yet been named by police. A spokesperson for Leicestershire Police said: “The emergency services were called to the property following reports that the property was well alight. 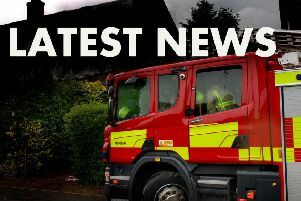 “Sadly a 72 year old woman has died and two men, aged 70 and 32, have been taken to hospital in Nottingham where they are receiving treatment for smoke inhalation.